It seems that Micromax is ready to launch yet another dual SIM smartphone (GSM + CDMA), the Canvas Duet 2 II. The phones comes with 5.3 inch IPS display, 1.2GHz quad core processor and 8MP primary shooter. 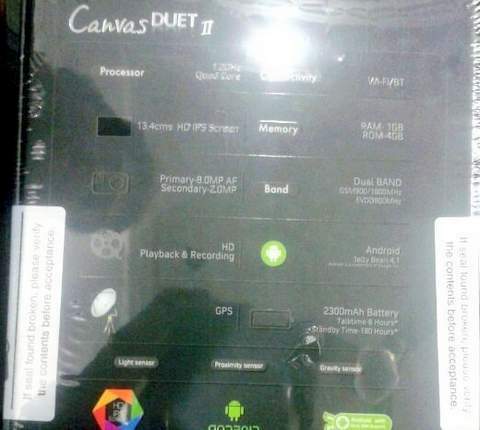 The Canvas Duet II is company’s third CDMA smartphone. The phone has 1GB RAM and 4GB of internal storage, which is better than the Blaze MT500 which was launched few months back. The handset runs on Android 4.1 Jelly bean OS and houses 2300 mAh battery. It packs with 8-megapixel rear and 2-megapixel front camera. Apart from the Canvas Duet 2 II, the company would soon launch Micromax Canvas Power which comes with 4000mAh battery. Below is the image of retail box of the phone (micromaxcanvas.co.in). As of now the company has not announced anything about its upcoming products. The Duet 2 would be priced Under Rs 16,000 and is expected to launch next week.